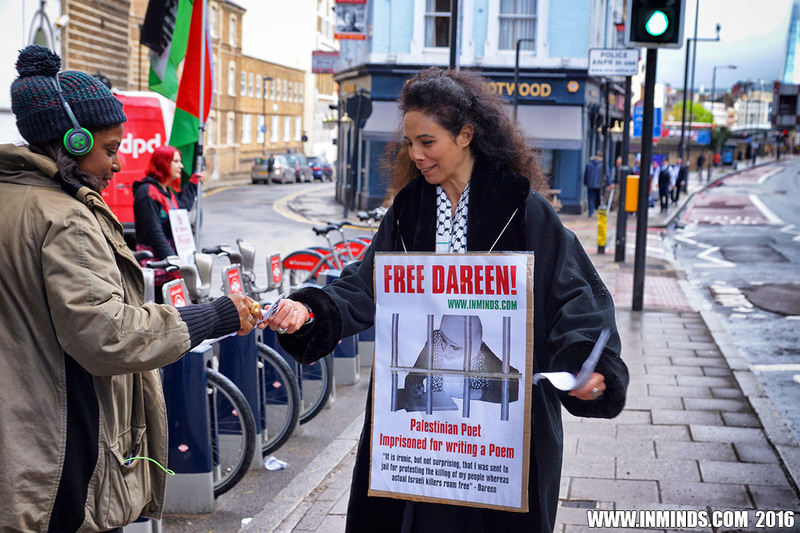 The activists also asked PEN to support Palestinian writers and journalists who are being targeted by Israel, in particular Palestinian poet Dareen Tatour who is currently under house arrest following 3 months imprisonment for writing a Poem. 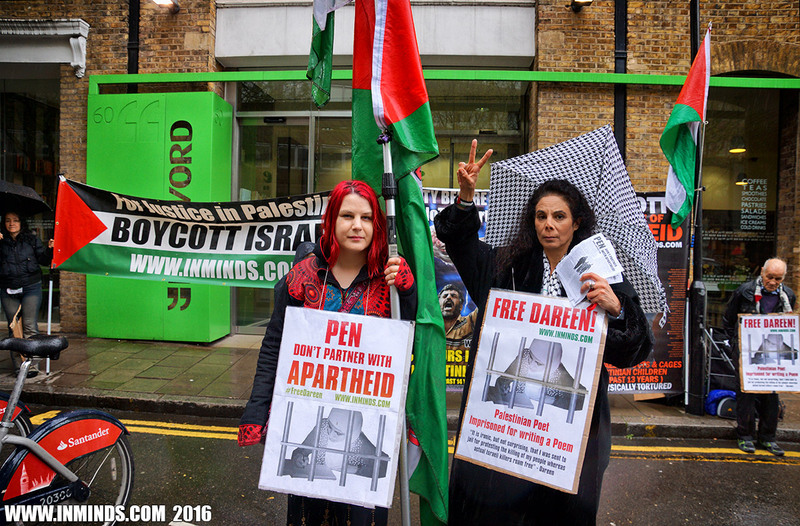 The protest follows a writers lead campaign in the US calling on PEN to reject Israeli government sponsorship. Pulitzer recipients Junot Díaz, Richard Ford and Alice Walker, and National Book Award-winning author Louise Erdrich, and Dr. Cornel West and Angela Davis are among signatories of the letter sent to PEN last month. 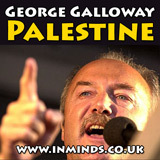 Inminds chair Abbas Ali said "PEN has ignored the pleas of 140 prominent writers to respect the Palestinian call for a cultural boycott of Israel, and has shamefully taken money from an apartheid regime and in return for that money they have white washed Israel's crimes and listed Israel as a 'champion' of World Voices Festival which launches in New York this evening. 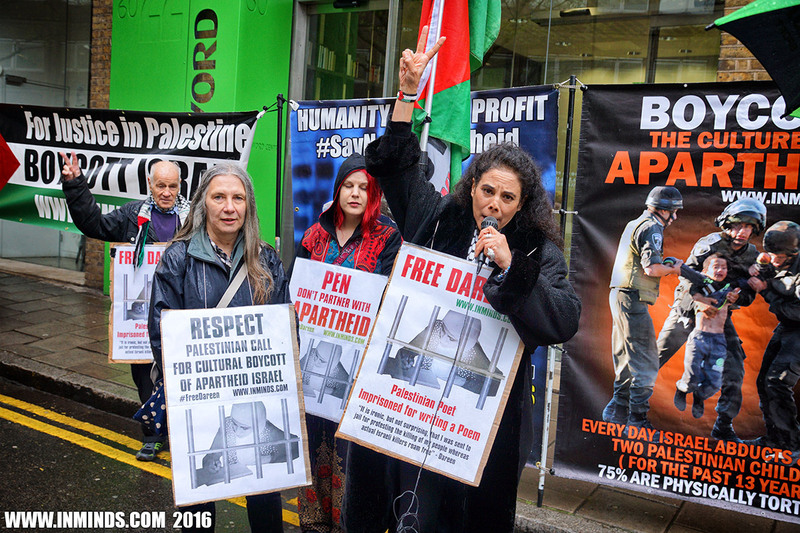 We are outraged that an organisation that claims to 'uphold writers freedoms' is deaf to the silencing of Palestinian writers by Israel. Today 20 Palestinian journalists are languishing in Israeli prisons for their words and over 150 bloggers have recently been arrested. 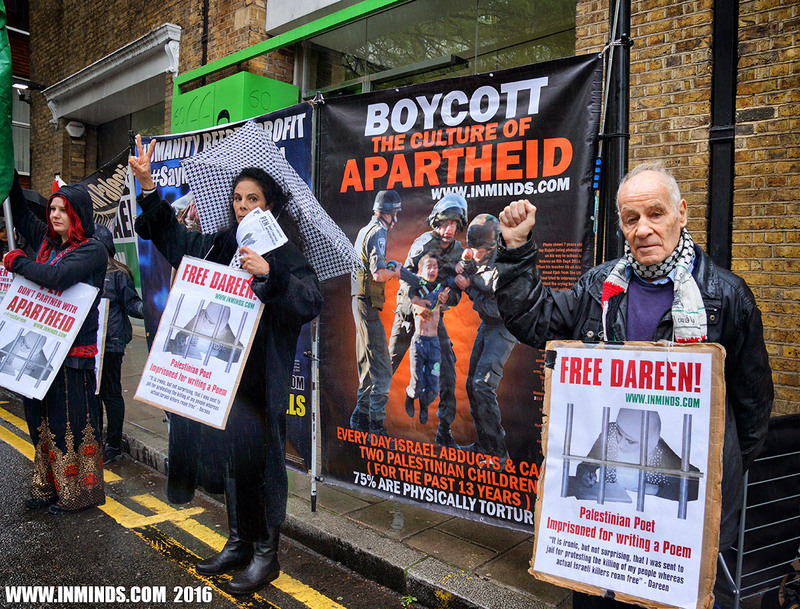 Palestinian poet Dareen Tatour has been locked up in a rat infested dungeon for 3 months because Israel coudn't stomach her poem 'Resist, my people, resist them'. Just two days ago the Palestinian Journalists Syndicate leader Omar Nazzal was abducted by Israeli occupation forces whilst on his way to an international meeting of the European Federation of Journalists taking place in Sarajevo today, on 25th April, the same day PEN's World Voices Festival starts where Israel is honoured as a 'Champion'! 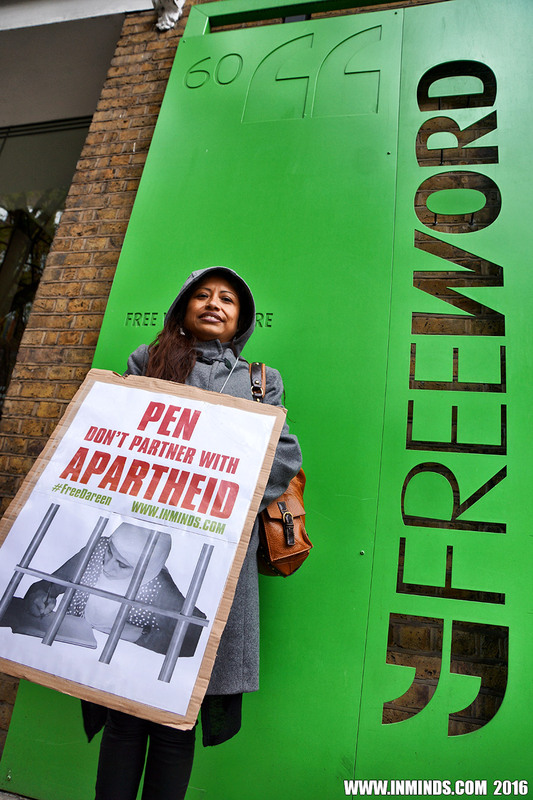 Is this really what PEN has been reduced to - championing the oppressor over the oppressed?" This evening in New York, PEN American launches its World Voices Festival. 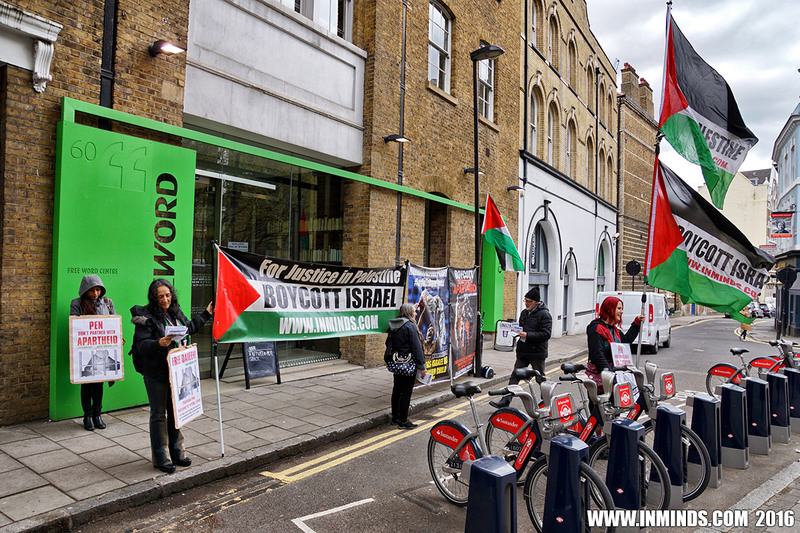 PEN American has shamefully partnered with the Israeli Embassy and taken apartheid money and in return for that money it has listed Israel as a "champion" of World Voices Festival. PEN American is part of PEN International "the worldwide writers' association which promotes the freedom to write and the freedom to read". PEN International was born here in London. 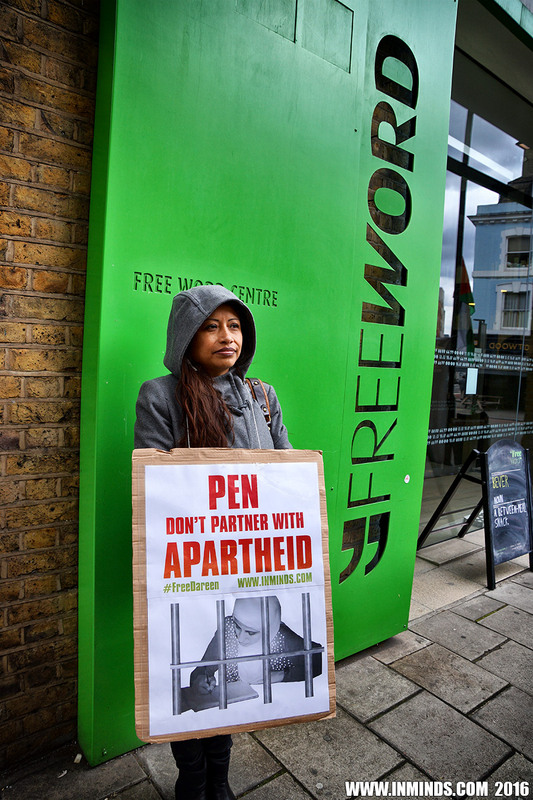 We are here today outside the Free Word Centre in Farringdon in London, the headquarters of English PEN , the founding centre of PEN International. 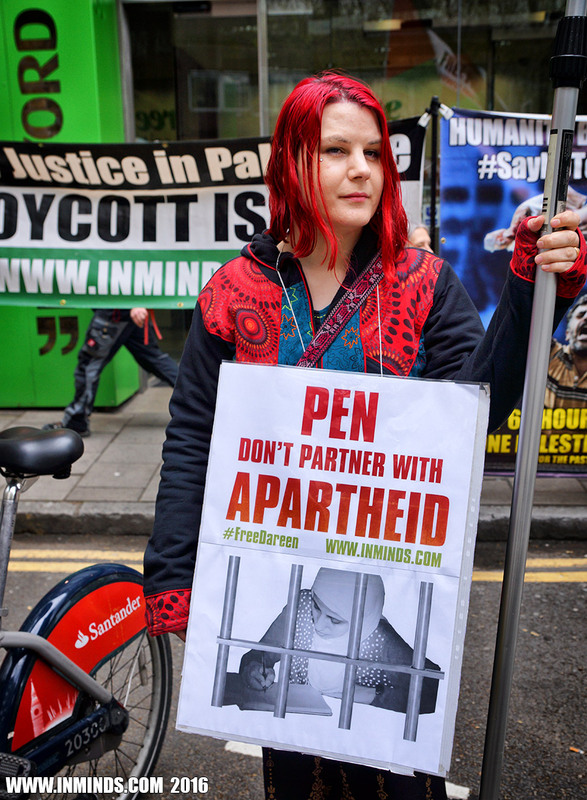 We want to respectfully ask English PEN to distance itself from its sister organisation PEN American, by taking a moral stand and support the Palestinian call for a cultural boycott of Israel. 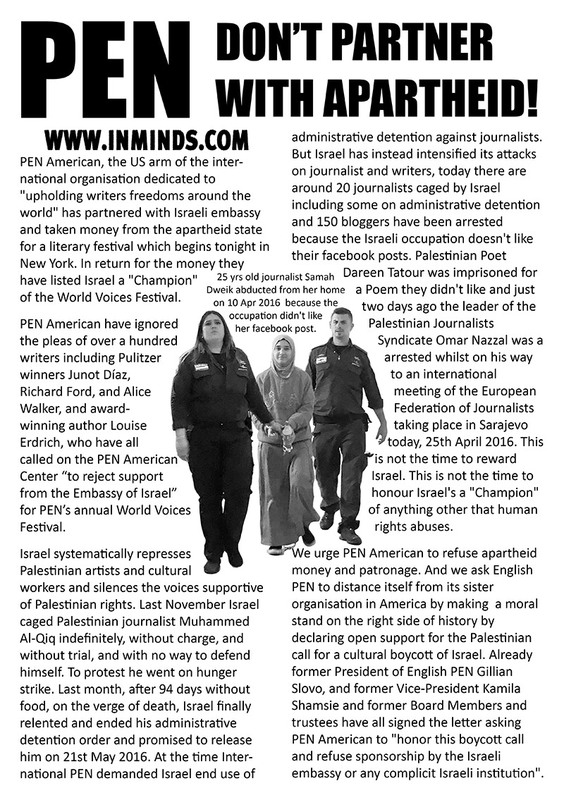 PEN American has ignored the pleas of over a hundred writers including Pulitzer winners Junot Díaz, Richard Ford, and Alice Walker, and award-winning author Louise Erdrich, who have all called on the PEN American Center “to reject support from the Embassy of Israel” for PEN’s annual World Voices Festival. 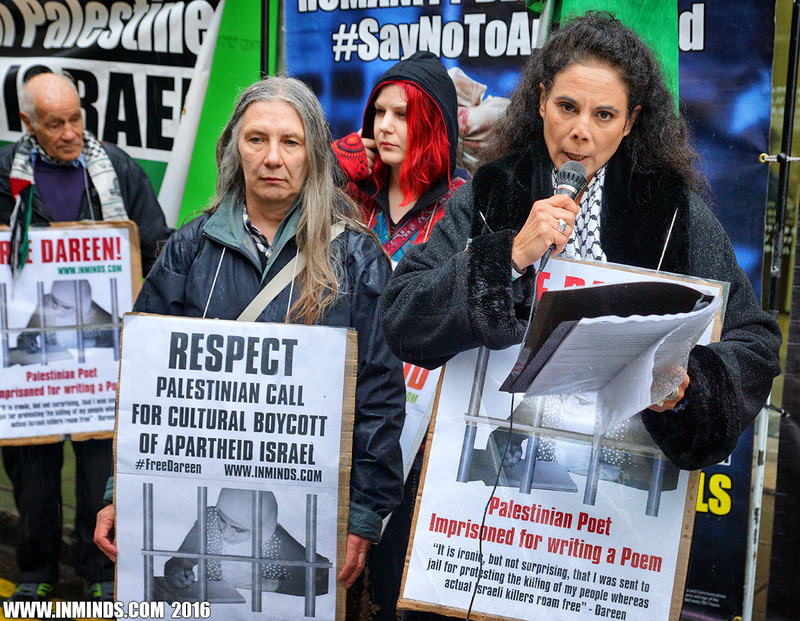 Israel systematically represses Palestinian artists and cultural workers and silences the voices supportive of Palestinian rights. Last November Israel caged Palestinian journalist Muhammed Al-Qiq indefinitely, without charge, and without trial, and with no way to defend himself under Israeli's system of administrative detention which is illegal under the 4th Geneva convention. 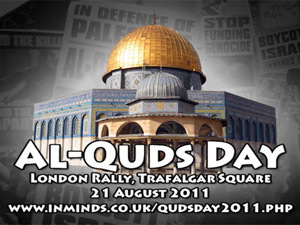 To protest Muhammed Al-Qiq went on hunger strike. 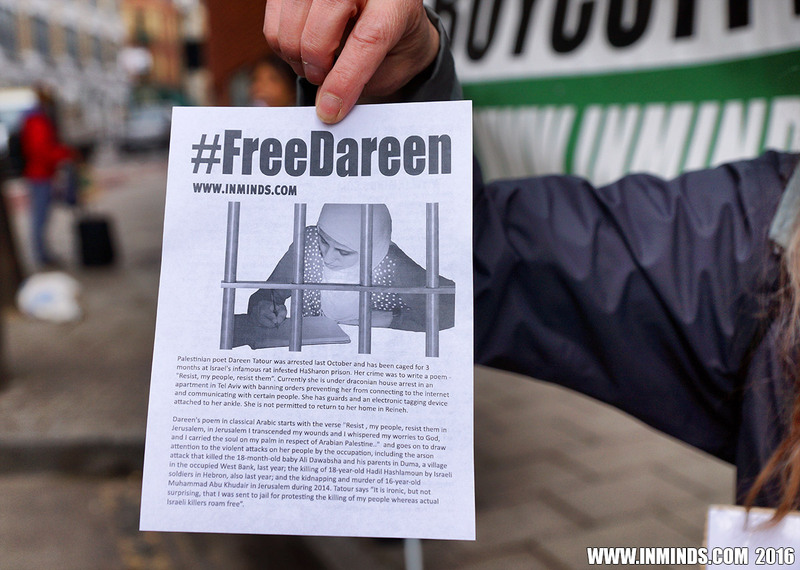 Last month, after 94 days without food, and on the verge of death, Israel finally relented and ended his administrative detention order and promised to release him on 21st May 2016. 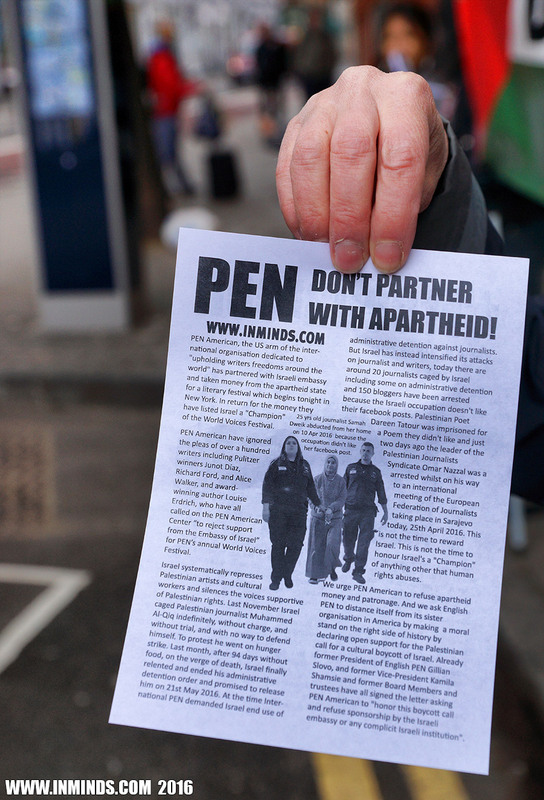 At the time International PEN demanded Israel end the use of administrative detention against journalists. 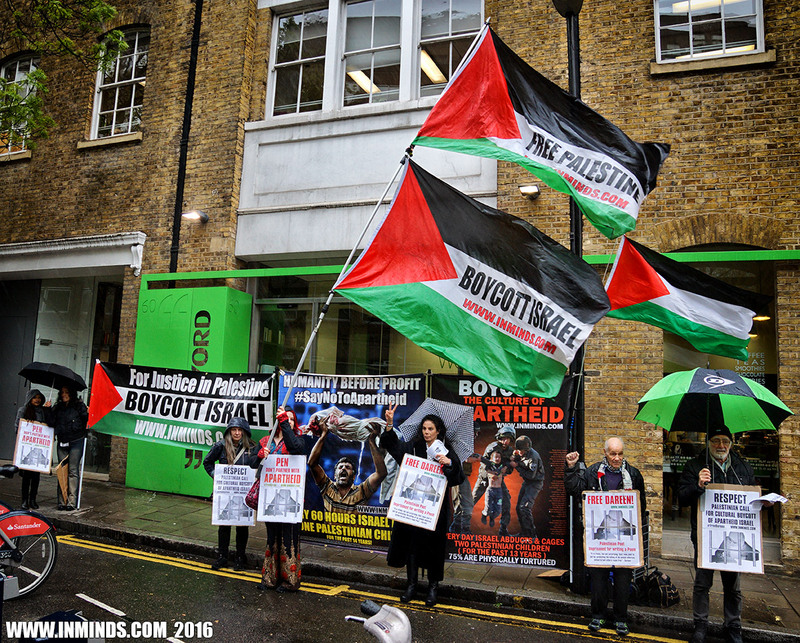 But Israel has instead intensified its attacks on journalist and writers. Today there are around 20 journalists caged by Israel including some on administrative detention and 150 bloggers have been arrested because the Israeli occupation doesn't like their facebook posts. One example is 25 yrs old journalist Samah Dweik who abducted from her home two weeks ago, on 10 Apr 2016, because the occupation didn't like her facebook post. 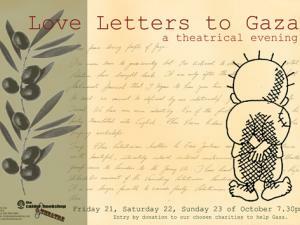 Another example is of Palestinian poet Dareen Tatour. 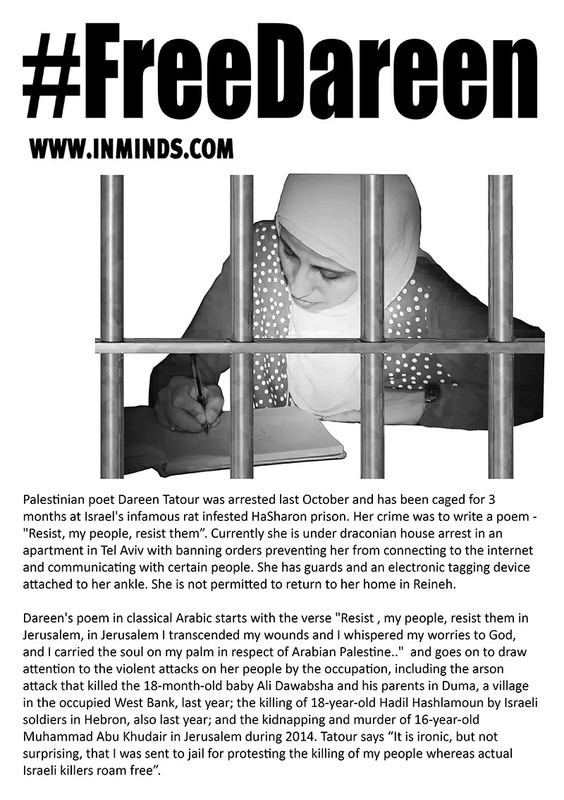 Dareen Tatour was arrested last October and has been caged for 3 months at Israel's infamous rat infested HaSharon prison. 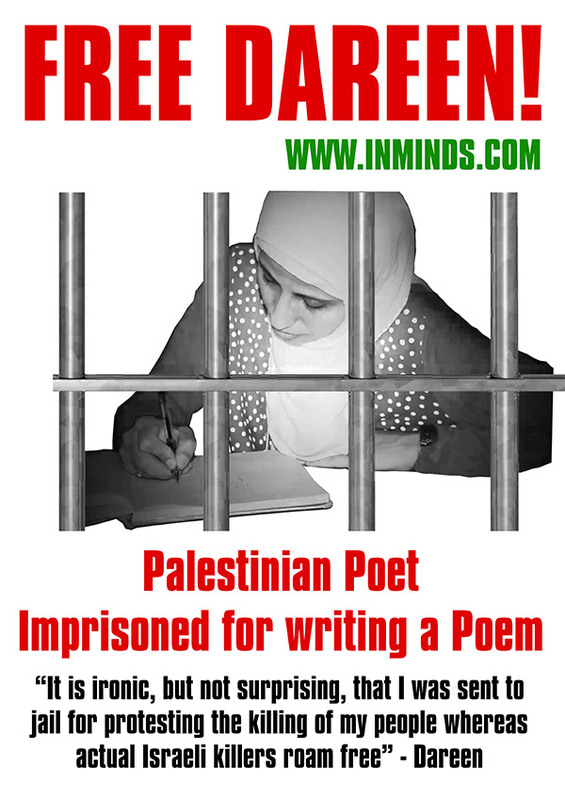 Her crime was to write a poem - "Resist, my people, resist them”. 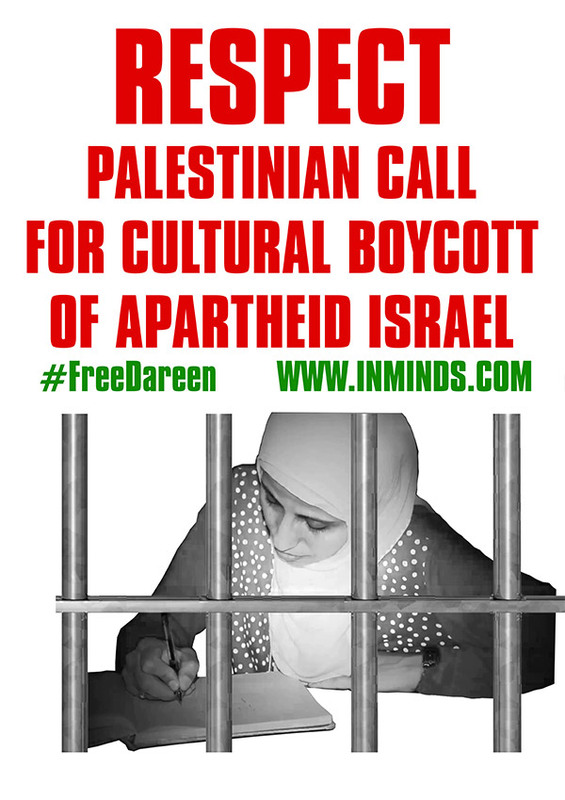 Currently she is under draconian house arrest in an apartment in Tel Aviv with banning orders preventing her from connecting to the internet and communicating with certain people. She has guards and an electronic tagging device attached to her ankle. She is not permitted to return to her home in Reineh. 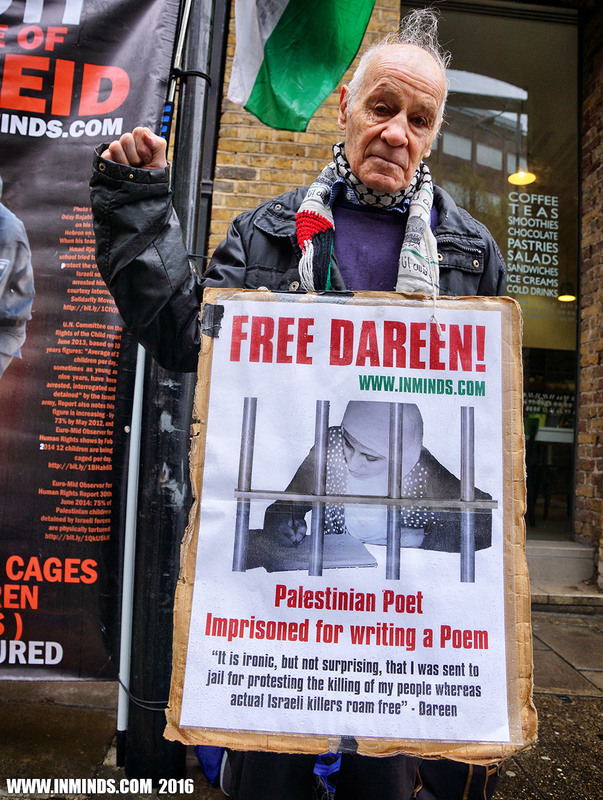 Dareen's poem in classical Arabic starts with the verse "Resist , my people, resist them in Jerusalem, in Jerusalem I transcended my wounds and I whispered my worries to God, and I carried the soul on my palm in respect of Arabian Palestine.." and goes on to draw attention to the violent attacks on her people by the occupation, including the arson attack that killed the 18-month-old baby Ali Dawabsha and his parents in Duma, a village in the occupied West Bank, last year; the killing of 18-year-old Hadil Hashlamoun by Israeli soldiers in Hebron, also last year; and the kidnapping and murder of 16-year-old Muhammad Abu Khudair in Jerusalem during 2014. 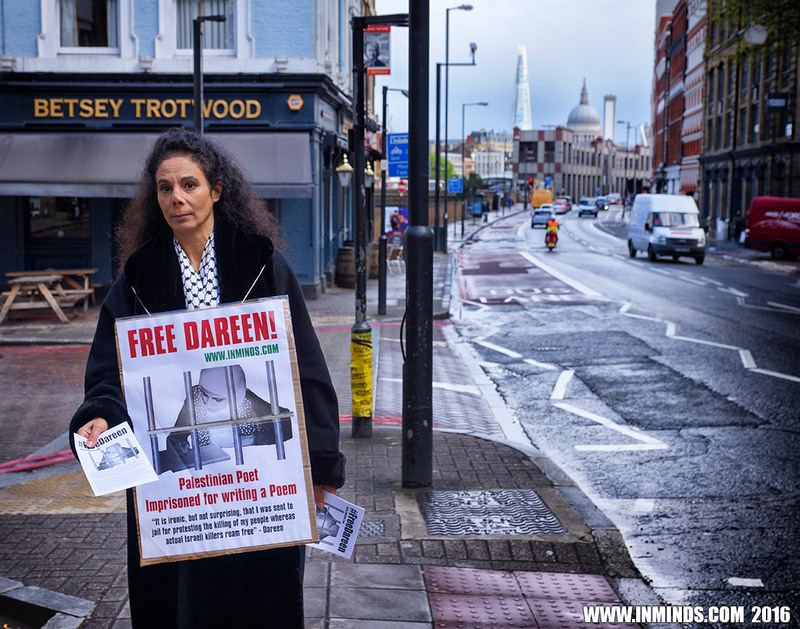 Dareen Tatour says “It is ironic, but not surprising, that I was sent to jail for protesting the killing of my people whereas actual Israeli killers roam free”. 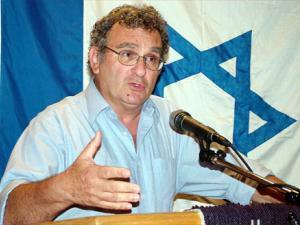 Israel's crimes against writers and journalists go unabated. 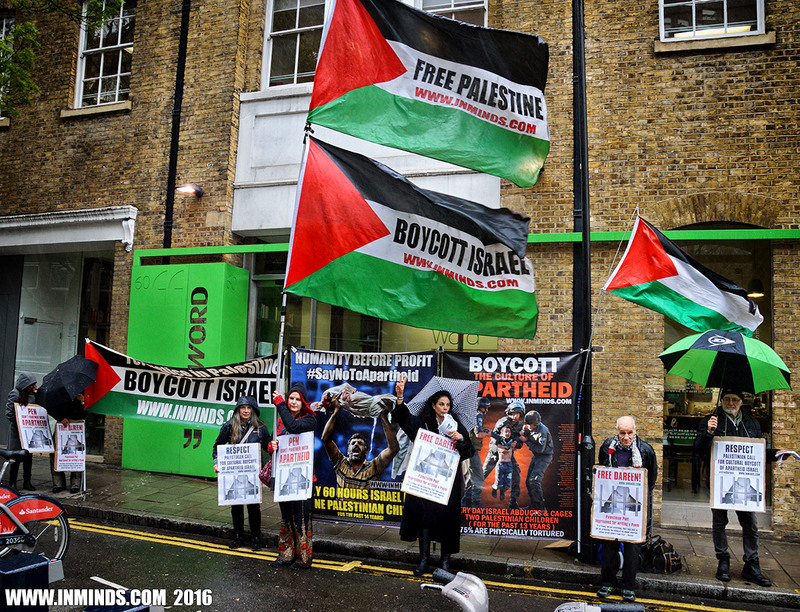 Just two days ago the leader of the Palestinian Journalists Syndicate Omar Nazzal was arrested whilst on his way to an international meeting of the European Federation of Journalists taking place in Sarajevo today, 25th April 2016. 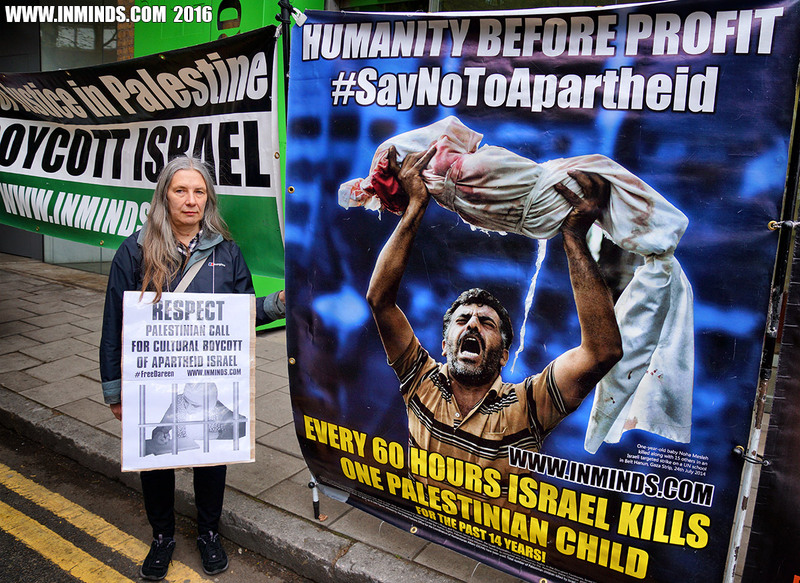 This is not the time to reward Israel. 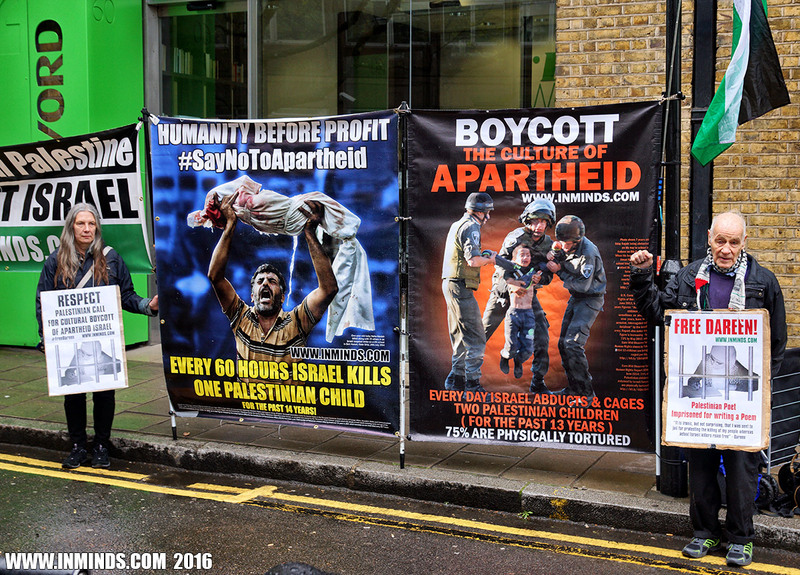 This is not the time to honour Israel as a "Champion" of anything other than abuses of human rights. 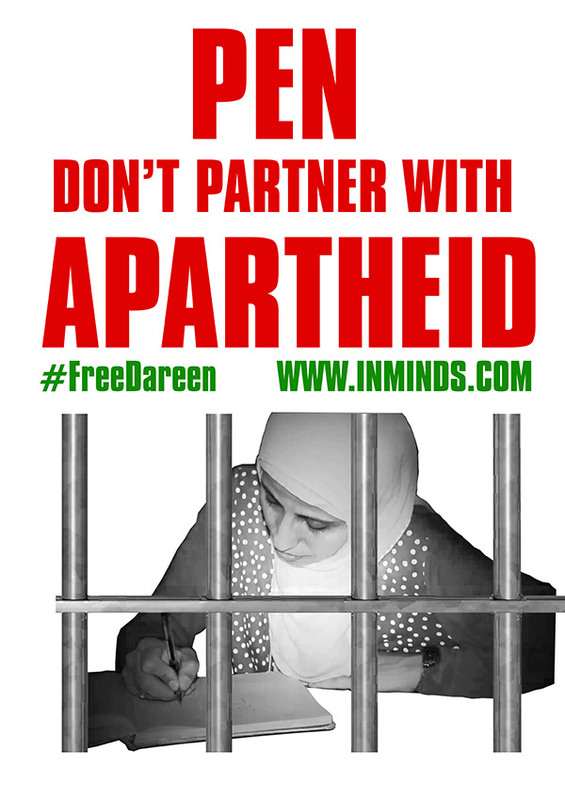 We urge PEN American to refuse apartheid money and apartheid patronage. 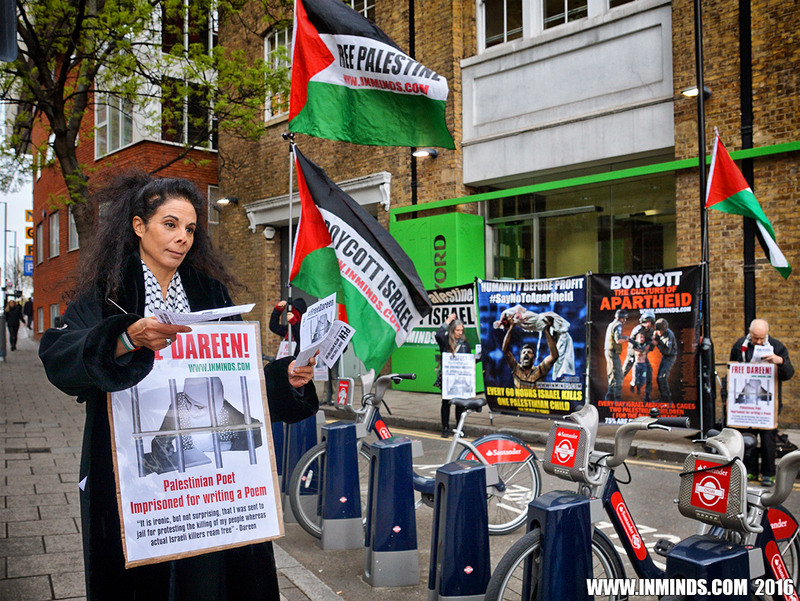 And we ask English PEN to distance itself from its sister organisation in America by making a moral stand on the right side of history by declaring open support for the Palestinian call for a cultural boycott of Israel. 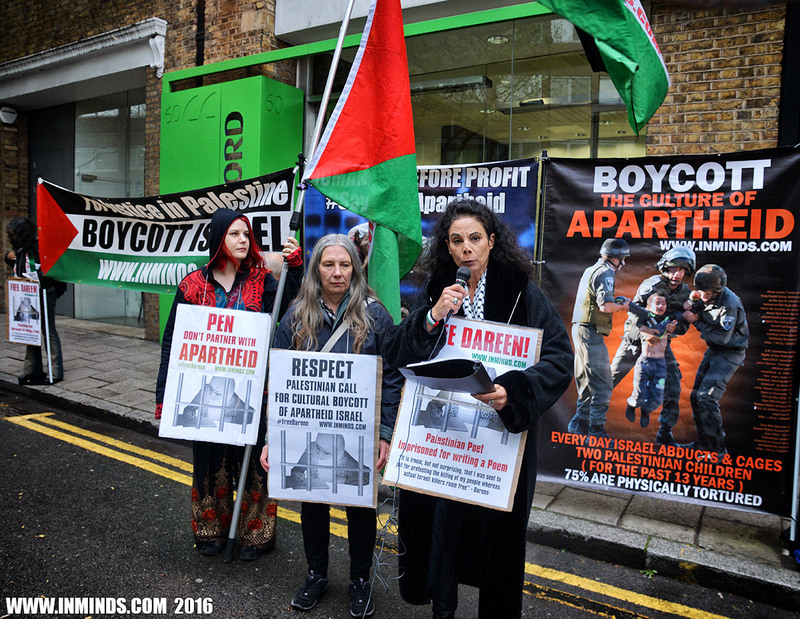 Already former President of English PEN Gillian Slovo, and former Vice-President Kamila Shamsie and former Board Members and trustees have all signed the letter asking PEN to "honor this boycott call and refuse sponsorship by the Israeli embassy or any complicit Israeli institution". 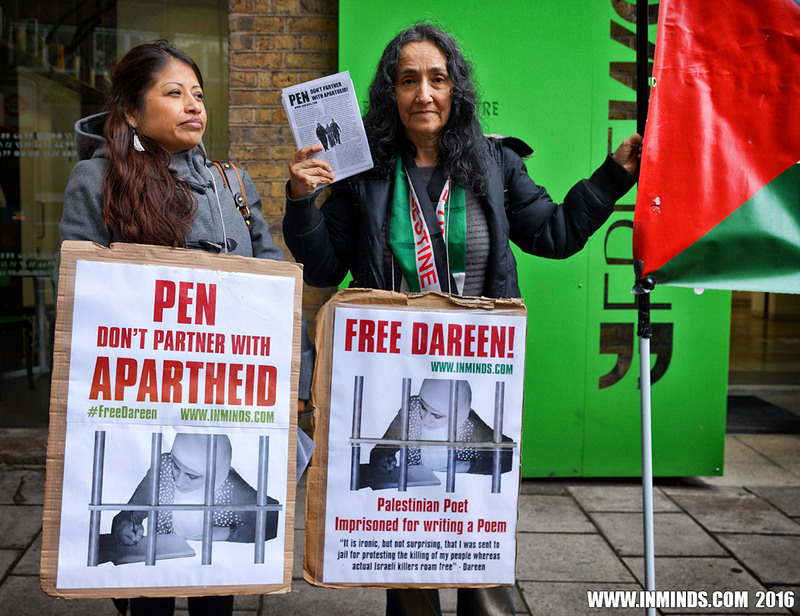 We ask English PEN to champion the rights of Palestinian writers like Dareen Tatour, Omar Nazzal and Samah Dweik, and all Palestinians suffering under colonial Israeli occupation. 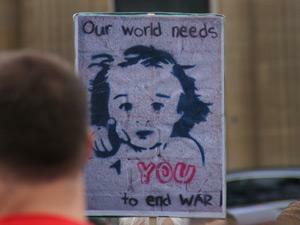 But PEN American Center has publicly advocated that the tactic be used in certain situations. Just last week the organization tweeted out a letter, signed by PEN American Center, urging singer Enrique Iglesias to cancel his upcoming concert in Azerbaijan. 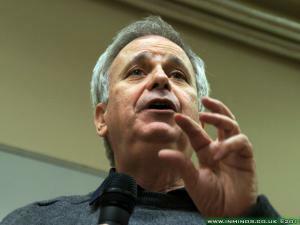 The Spanish star was urged to protest against human rights abuses in Azerbaijan, including the jailing of journalists. 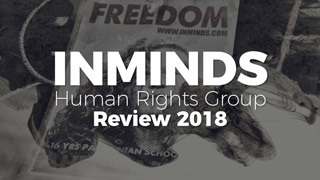 Similarly, PEN American Center signed a letter to several country leaders in 2015 asking them to make their participation in the inaugural event of the European Games that were scheduled to take place in Azerbaijan contingent on the release of eight journalists and five human rights activists. 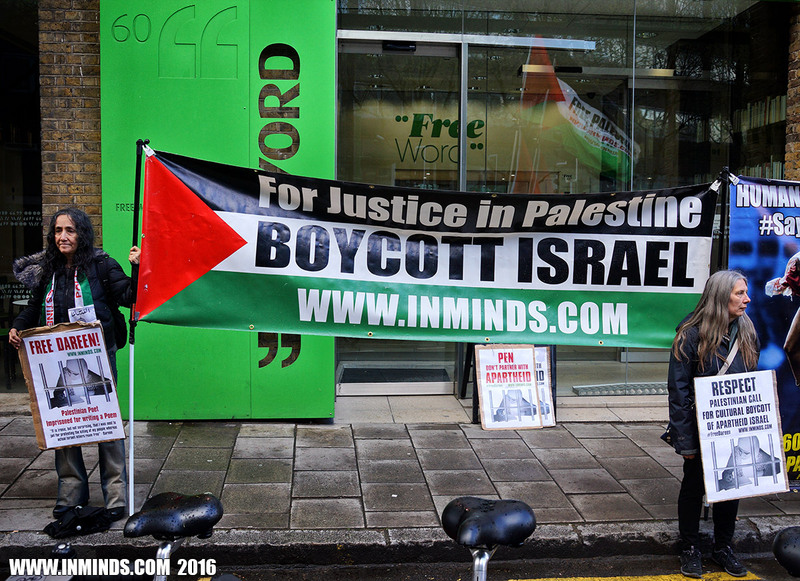 While the letter stated it was not seeking a “public boycott” of the event, it did actually recommend a boycott. It asked the UK and Ukrainian governments to refrain from sending a “high-level delegation” to the games if the prisoners in question were not released. 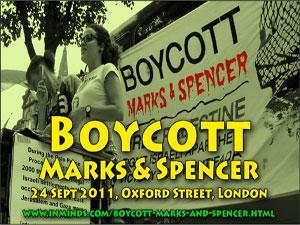 Nossel has not been averse to calling for boycotts in a personal capacity, either. Along with running PEN America, Nossel is what certain media describe as a “volunteer adviser” on human rights to Hillary Clinton’s presidential election campaign. Nossel was also a senior figure in the State Department when Clinton was secretary of state. After leaving the State Department, she headed Amnesty International’s US branch. Under Nossel’s leadership, Amnesty ran an ad campaign portraying the US-led invasion of Afghanistan as beneficial to that country’s women. 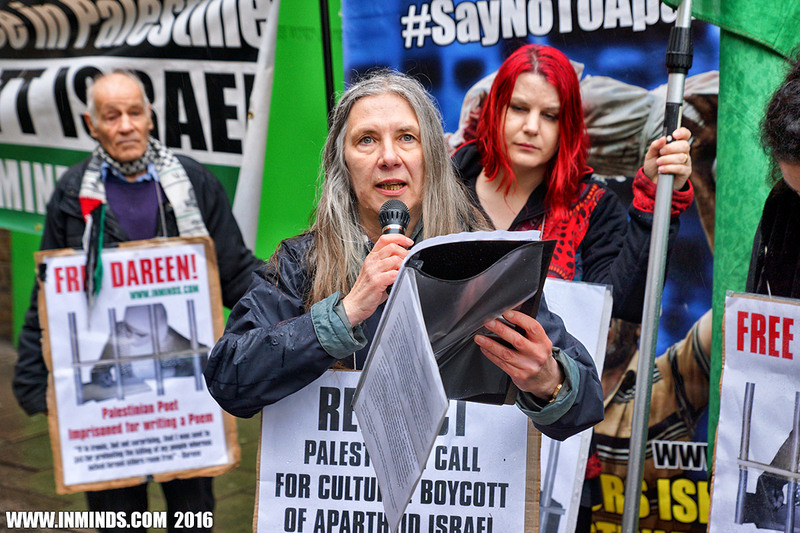 More than 200 prominent literary figures and 16,500 other individuals have signed a letter criticizing PEN American Center for accepting Israeli sponsorship. The Asian/Pacific/America Institute at New York University recently canceled its event at the World Voices Festival, scheduled for Friday. The panel, titled “The Language of War,” was to have featured the poets Solmaz Sharif, Jennifer Tamayo, and Jennifer Hayashida. 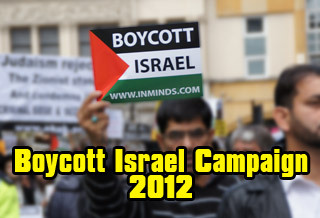 All declared their support for boycotting the festival because it had accepted funding from the Israeli government. The pressure on PEN American Center appears to have been effective. 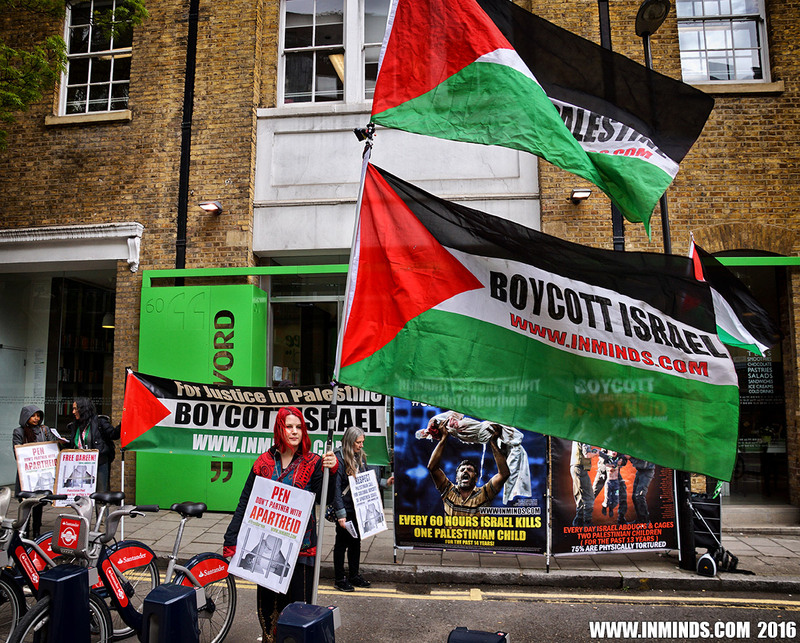 Jennifer Clement, president of its parent organization PEN International, recently promised to address criticisms raised by Adalah-NY, a New York-based group advocating a boycott of Israel. 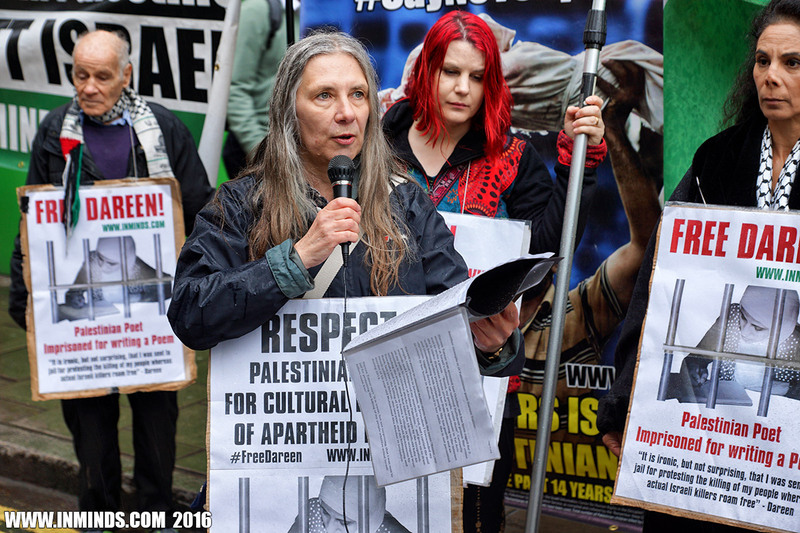 PEN American Center has also broken its silence over recent human rights abuses by Israel. 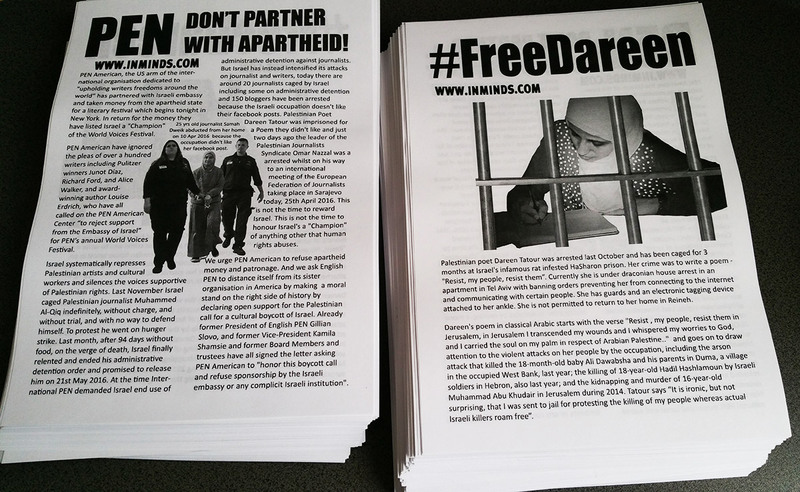 On Thursday, PEN American Center issued a statement asking the Israeli government to explain why it has jailed the Palestinian journalist Omar Nazzal. He has been placed in administrative detention – detention without charge or trial – after Israel arrested him in the past week at the Israeli-controlled crossing between Jordan and the occupied West Bank. Nazzal was traveling to a meeting of the European Federation of Journalists in Bosnia. 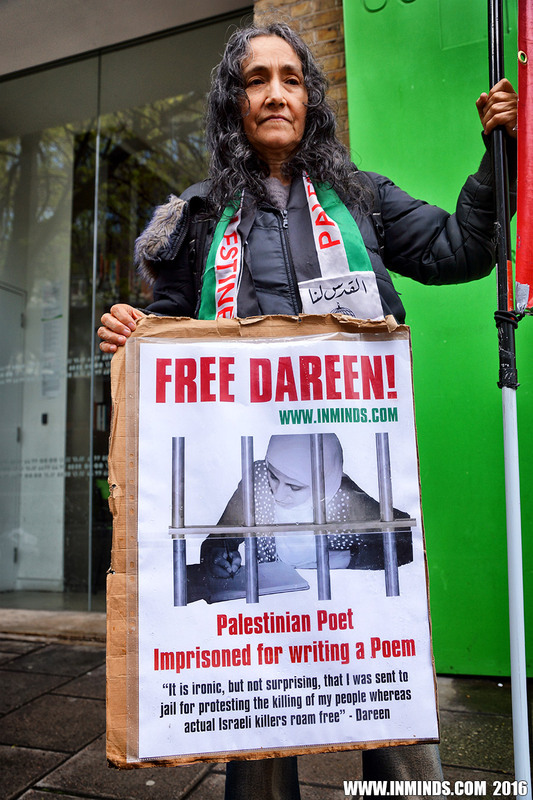 The PEN statement also expressed concern about the detention and prosecution of Palestinian writer Dareen Tatour, who was arrested and charged with “incitement to violence” for a poem that she wrote calling for resistance to Israeli brutality. 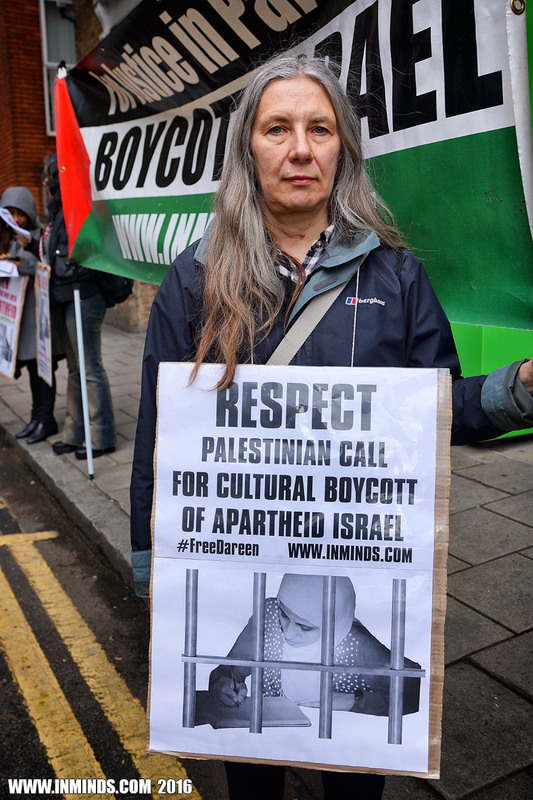 Ru Freeman, a novelist who has been campaigning for PEN to cease accepting Israeli sponsorship, told The Electronic Intifada that this week’s statement was made “under enormous pressure” from Palestine solidarity campaigners and the wider public. At least 19 Palestinian journalists are currently being held in Israeli custody and more than 40 Palestinian journalists have been detained since October 2015. Israel has, for instance, held 25-year-old Palestinian journalist Samah Dweik since 10 April, charging her with “media incitement” based on what she has posted on Facebook. The reason given for the demotion was the increasing influence of Sheldon Adelson’s newspaper, Israel Hayom, which features a growing portion of government-paid content not clearly identified as such to readers. 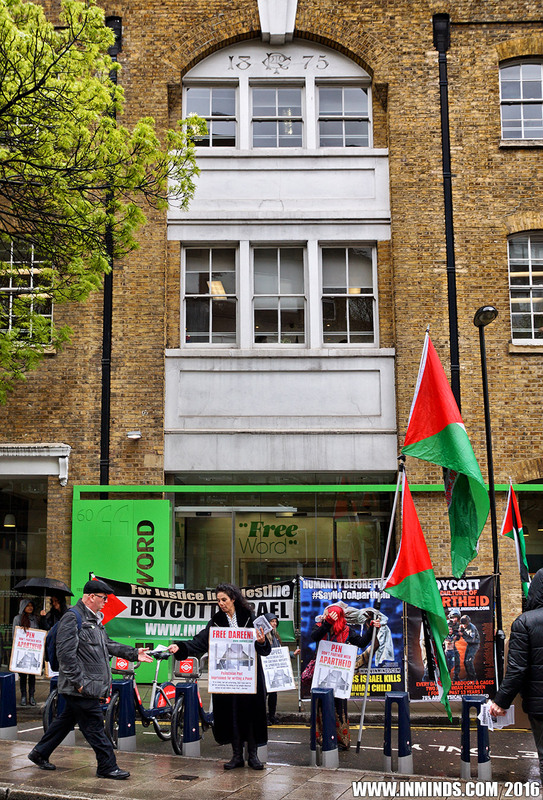 Freedom House notably excludes from its criteria for its rankings Israel’s treatment of Palestinians in the occupied West Bank and Gaza Strip – despite the fact that Israel exercises the authority to arrest, imprison and kill Palestinian journalists. 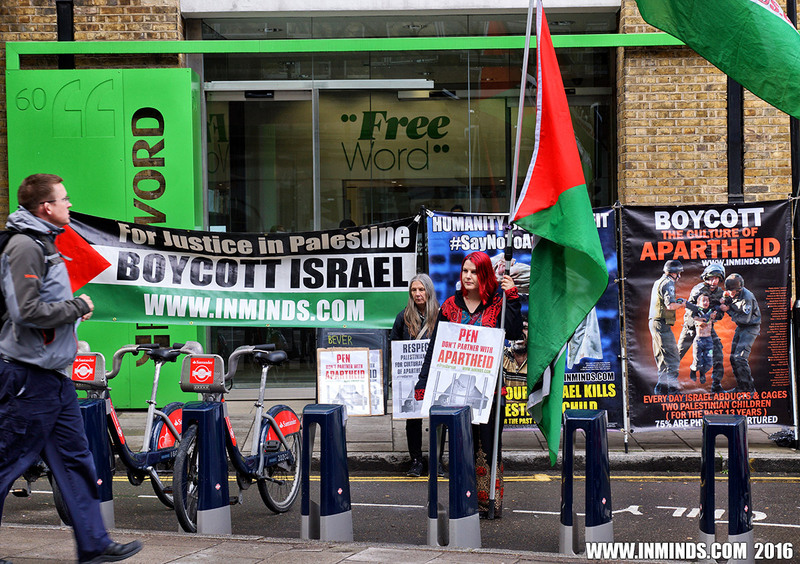 In contrast, Reporters Without Borders does consider Israel’s treatment of those journalists, and consistently ranks Israel in the bottom tier of its world press freedom index.